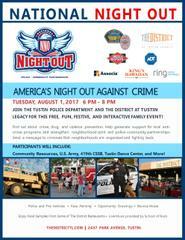 Please join the Tustin Police Department and several of our partnering groups and organizations at The District this coming Tuesday night for National Night Out (NNO). NNO is designed to promote police-community partnerships and neighborhood camaraderie to make our neighborhoods safer. There will be entertainment, demonstrations, police and fire vehicles, community resource organizations, a kid’s area with a bounce house, face painting, and games. Many of The District businesses will also be participating! We hope to see you on Tuesday, August 1, 2017 at The District. The event will take place in the parking lot area near the valet parking from 6 pm to 8 pm.